The transition from Qajar rule in Iran (c.1789-1925) to that of rule by the Pahlavi dynasty (1925-1979) set in motion a number of shifts in the political, social, and cultural realms. 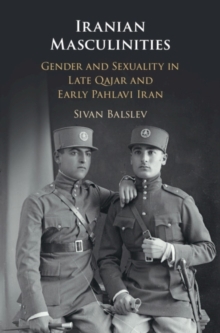 Focusing on masculinity in Iran, this book interweaves ideas and perceptions, laws, political movements, and men's practices to spotlight the role men as gendered subjects played in Iranian history. It shows how men under the reign of Reza Shah dressed, acted, spoke, and thought differently from their late Qajar period counterparts. Furthermore, it highlights how the notion of being a "proper Iranian man" changed over these decades. Demonstrating how an emerging elite of western-educated men constructed and promoted a new model of masculinity as part of their struggle for political, social, and cultural hegemony, Balslev shows how this new model reflects wider developments in Iranian society at the time including the rise of Iranian nationalism and the country's modernisation process.